Far North Queensland is an area known for its natural attractions, with the reef and rainforests hosting a multitude of activities. We merely dipped our toes in the water of what’s on offer during a short trip in September, but here are some places we think you should check out if you’re heading up north. When we checked into our junior suite rooms, the sun was just starting to set over Trinity Inlet, the waterway along which cruise ships and tour vessels travel to and from the Great Barrier Reef. It’s a relaxing backdrop for drinks on the balcony – and also makes a great view to enjoy from the spa bath (another luxury which is included in every room in the hotel). 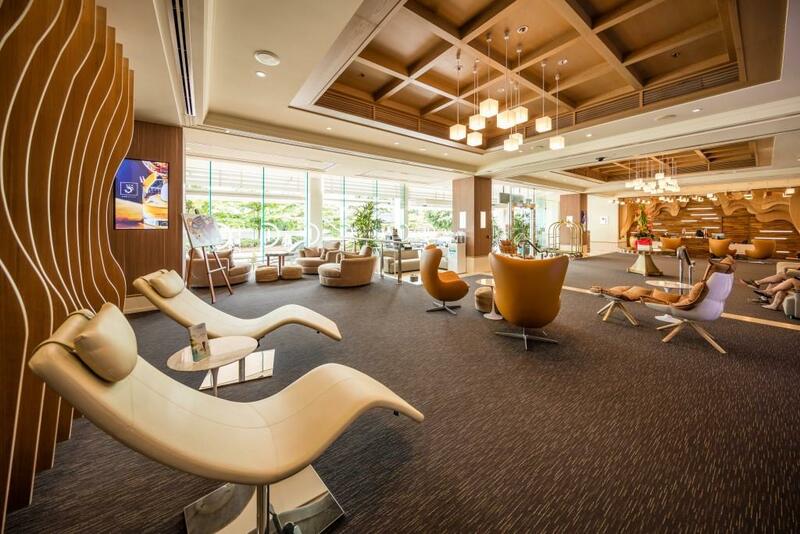 For those who crave an adrenaline rush, the Casino and the Cairns Zoom and Wildlife Dome are both located within the hotel complex, or for a more traditional workout, head to the hotel’s rooftop gym. The adjacent outdoor pool has views over Cairns – a dip here is the perfect way to refresh before dinner at the multi award-winning Tamarind Restaurant, where regional produce stars in innovative Asian fusion dishes. The organic tablelands pork I ordered was melt-in- the-mouth tender and supremely tasty, while my partner’s wild caught local reef fish accented with paperbark smoked beetroot gel scored two very satisfied thumbs up for both presentation and flavour. 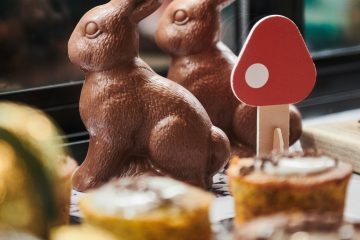 We didn’t think it would be possible to top the mains, but the shared dessert platter changed our minds – chocolate semifreddo, caramel glaze entrement and finger lime panna cotta all make use of local ingredients such as native bee honey and tropical fruits to create sweet treats with a unique Tamarind twist. After a dinner like that, settling in for slumber is really the only sensible option. Make the most of your luxury surroundings in an oversized bed with pillows customised just for you, then start the day with a sensational breakfast at Tamarind – it’s just another of the benefits that every guest enjoys. Set on 145 acres of native forest and edged by the Coral Sea, Thala Beach Nature Reserve is the epitome of tropical serenity, so the raucous reception for guests as they enjoy welcome drinks in the resort’s Ospreys Restaurant may be something of a surprise. The happy cacophony is thanks to a flock of rainbow lorikeets and metallic starlings splashing in a treetop pool just metres from the dining tables, which offer a spectacular view over bushland and out to the sea. It’s tempting to sit and watch the birds, but there’s so much to do on this unique private headland. Wander down to the water’s edge, where a beachcombing stroll reveals coastal plant life and shells whose forms remain unchanged since prehistoric times. Or take a dip in the tropical waters of the Coral Sea, season permitting (the presence of marine stingers from November to May makes swimming in of the two freshwater pools on the property the more attractive option). Several kilometres of walking track meander through the property’s mix of rainforest, mangrove lagoons, beaches and woodlands. Wallabies, birds and butterflies are all part of the scenery, with complimentary tours offering guests the chance to view native flora and fauna in its natural habitat and an observatory where you can stargaze unimpeded by big city lights. Of course there’s views aplenty even from your own balcony. We stayed in a Coral Sea Bungalow, which is perched to take in the glorious scenery stretching from the forest down to the ocean, while other accommodation options are nestled in bushland or overlooking sand dunes and a cluster of islands. Wherever you stay, make time to hang out and enjoy the beauty of nature as you wake up with a morning coffee or wind down with a glass of red before dinner. Local produce is the star at Ospreys Restaurant, with barramundi, coconut, mango and wattleseed just some of the featured ingredients on the modern Australian-style menu. Dining by soft light surrounded by the forest canopy is the perfect end to a day of tropical delights, topped only by a relaxing night’s sleep with ocean waves and the occasional birdcall as the soundtrack. Blessed as the region is with beautiful beaches, you could be forgiven for spending all your waking hours reclining by the water. But the biodiversity of the area means there are unique adventures aplenty, with Instagrammable scenery and memorable moments at every turn. Cape Trib Farm caters for foodies with its exotic fruit tasting tours. 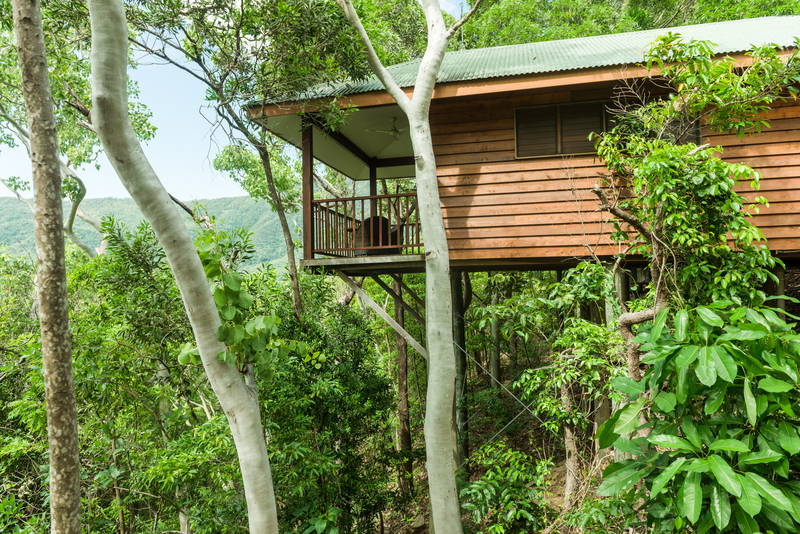 Its location at the edge of the Daintree rainforest makes it ideal for growing tropical fruits that hail from as far away as the Amazon. There are more than 60 different types of fruits growing on the family-run farm, with tours allowing guests to try seasonal crops such as the fruit-salad flavoured soursop, toffee-sweet sapodilla, lemon meringue pie-like rollinia and sapote, whose flesh resembles a rich creamy custard. This is a journey your tastebuds won’t forget! Just across the road from Cape Trib Farm is the office of Jungle Surfing. As with the fruit tasting, Jungle Surfing is done while seated – but in this case, you’re far from static! Quite the opposite, as the objective is to fly through the air via a network of zip-lines that join old and new growth forest. 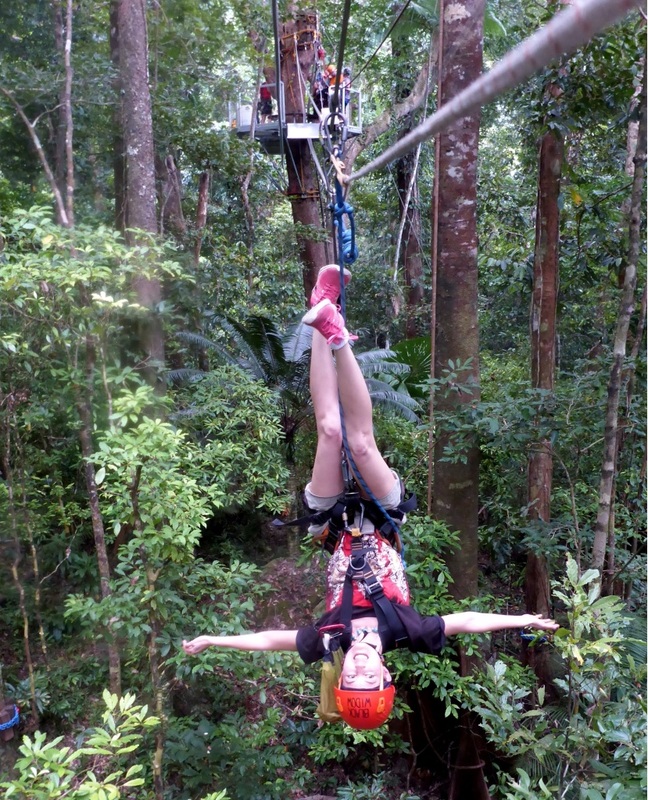 Guides make sure guests are safely harnessed and helmeted, then send them zipping from tree to tree, giving insights into the Daintree’s natural wonders and the engineering feats that allowed the zip-lining infrastructure to be built with no heavy machinery or mains power. A highlight is hanging upside down as you fly over ancient trees, maybe even spotting a tree kangaroo or two if you’re lucky. If you prefer your adventures earth-bound, a Kuku Yalanji Cultural Habitat Tour is for you. 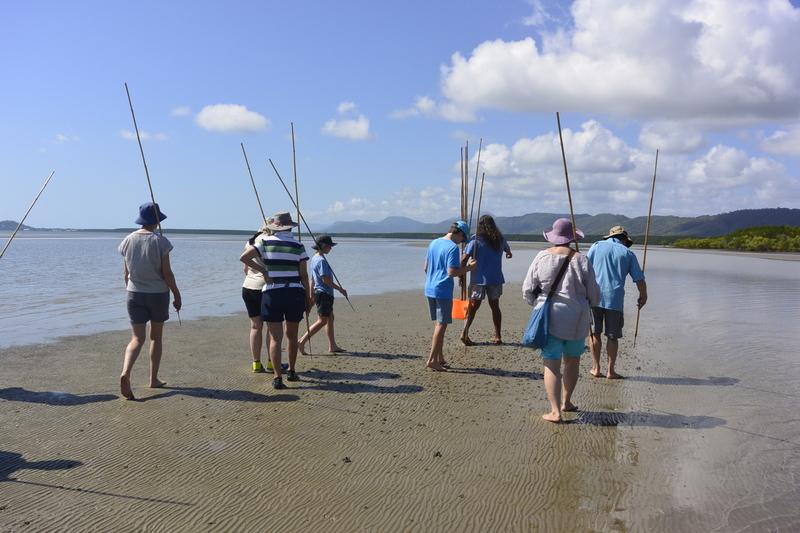 Based 15 minutes north of Port Douglas at Cooya Beach, these walking tours through the unique bioregion are led by Kuku Yalanji brothers Linc and Brandon Walker. Wade through the warm shallows past mangroves to spot hermit crabs, stingrays and puffer fish and try your luck spearing mudcrabs for lunch, or escape the sun for a night time tour on foot or by boat. Either way, thanks to fascinating commentary from your tour leader, you’ll leave with a deeper understanding and respect for the area’s wildlife and for the indigenous people who have lived in harmony with the land for countless generations. No visit to Cairns is complete without a trip to the Great Barrier Reef, but there’s a bewildering array of tours and prices. Luckily, a quick Google search turned up this comparison website and saved us the hassle of trawling through all the diving and snorkelling tours. The half-day tour to Green Island that we found on the site let us explore the tiny coral cay and its birdlife in between idle sunbaking and snorkelling with sea turtles. Although it could hardly be described as a tropical escape due to the large number of visitors, the island still makes for a pleasant getaway, especially if you’re short on time.